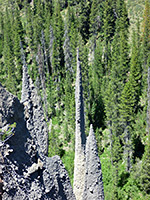 In the lower elevation southeast corner of Crater Lake National Park, the Pinnacles are a group of volcanic pumice spires, colored various shades of grey and brown, formed by erosion along the south edge of the steep-sided canyon of Wheeler Creek, a tributary of the larger Sand Creek that begins beneath the southern slopes of Mount Scott, the park's highest summit. 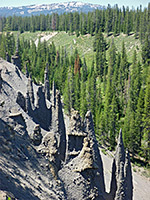 Some cones are especially tall and graceful, dozens of feet tall and tapering very gradually to a sharp point - perhaps the narrowest erosional features in the West, certainly more slender than, for example the hoodoos of Bryce Canyon in Utah or the strange pillars of the Tent Rocks in New Mexico. 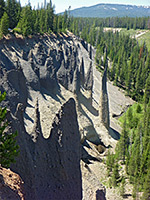 The pinnacles, also known as fossil fumaroles, are surrounded by a belt of vegetation-free earth, which contrasts greatly with the lush greenery all around; pine woods on the canyon rim, bushes and grass along the valley floor. 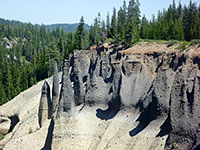 They may be viewed from overlooks at the end of the access road and along the half mile Pinnacles Trail that follows the valley further downstream, soon exiting the national park and meeting a forest track. This is a very short hike, but popular going to the unusual geology. 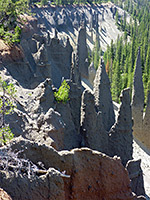 The six mile Pinnacles Road leads to the formations, forking southeast off the Rim Drive opposite Phantom Ship Overlook, and gradually descending through thickly forested terrain, past another trailhead (for Vidae Falls), the one-way Greyback Drive, and the Lost Creek tent-only campground, before ending at a parking area on the rim of Wheeler Creek canyon, known as Pinnacle Valley. 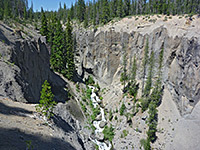 The formations rise up in the ravine below, formed of conglomerate-type rocks - compressed pumice and ash from long ago volcanic eruptions. Once when these rocks formed a thick, unbroken layer, hot gases escaping from below created long, narrow holes (fumaroles) surrounded by a heat-hardened lining, now left exposed as the softer deposits have eroded away. The path stays close to the rim giving views of a few other groups of formations and more distant spires on the far side of adjacent Sand Creek, but the band of eroded rocks soon gives way to a bushy hillside, and the trail reaches the park boundary, marked by a gate and the remains of an old NPS welcome sign. The route continues as FR 2304 and 9735, crossing part of the Winema National Forest for 11 miles to an intersection with US 97, though there is little of interest to see after the pinnacles.